Annika McKinney grew up on a farm in Northern Colorado. At an early age, she developed a love for books, music, and the land, and all of these impacted her view of the world. In 2013, she graduated from the University of Northern Colorado with a BA in music and a minor in literature. Her studies convinced her that learning was her passion, and since then she’s taken that passion to new places. In 2014, Annika married her husband Jared and spent a year in the wilds of Washington, D.C., teaching violin lessons to around 30 students. This teaching solidified what she learned at university and helped her become more empathetic with the needs of students and their parents. It was a great year, so after completing a teaching certification from Cambridge University, she decided to go even further afield and spend 2014-2015 in Beijing, China, teaching English to Chinese university students. Since then she's been to England and Singapore, and is happy to be back home in Colorado this year! 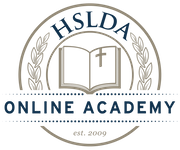 Annika also enjoys helping Americans learn to love great books and writing through HSLDA Online Academy. Annika has been teaching with the Academy since 2015.